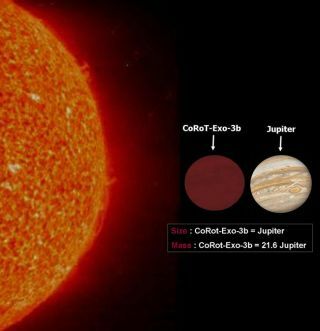 One of the densest exoplanet to date is a world known as COROT-exo-3b. It is about the size of Jupiter, but 20 times that planet’s mass, making it about twice as dense as lead. Scientists have not ruled out that the COROT-exo-3b may be a brown dwarf, or failed star. Astronomers have sighted a very dense planet-sized objectthat orbits its parent star in just four days and six hours. The object, COROT-exo-3b, fits into the category of afailed star known as a browndwarf, but the team that made the discovery has not ruled out thepossibility that it is a planet. Brown dwarfs are failedstars. They burn lithium but are not massive enough to generate thethermonuclear fusion of hydrogen and helium that powers real stars. Planets donone of that. "It has puzzled us; we?re not sure where to draw theboundary between planets and brown dwarfs,? said Hans Deeg, an astronomer atthe Instituto de Astrofisica de Canarias (IAC) in the Canary Islands, Spain. The object has a mass 20 times greater than that ofJupiter, but is roughly the same size. It falls outside the range of planetsand stars discovered to date, with the largest planets having 12-Jupiter-massand the smallest stars 70-Jupiter-mass. If astronomers confirm the object as a planet, it wouldweigh in as the most massive and densest planet foundso far. A full study will be detailed in the journal Astronomy andAstrophysics. "COROT-exo-3b might turn out to be a rare objectfound by sheer luck", said Francois Bouchy, an astronomer at the Institutd'Astrophysique in Paris. "But it might just be a member of a new-foundfamily of very massive planets that encircle stars more massive than our sun.We?re now beginning to think that the more massive the star, the more massivethe planet." Ground-based telescopes around the world helped pinpointthe object, including observatories in France, Chile, Germany, Hawaii, Israeland Spain's Canary Islands. The hunt for exoplanets has intensified over recentyears, with astronomers usually findingsuch objects indirectly by observing their gravitational influence onparent stars. Another team showcased what might be the firstdirect image of an exoplanet around a sun-like star in September.